It took two hours, six forms and just as many instruction booklets for us to do our 2009 taxes. 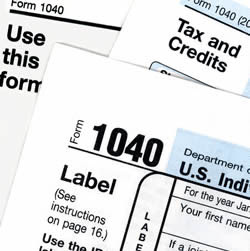 Gone are the days of the 1040EZ forms with just a W-2 and a few 1099s to deal with. Oh, no. Buying a house has advanced us in the world of taxes. We’re now allowed to deduct mortgage interest and property taxes, claim energy credits and the first-time homebuyer tax credit, and figure out penalties on early Roth IRA withdrawals. Yes, I said early Roth IRA withdrawals. It’s another one of my dirty little secrets: When we were scraping together money for the 20% down payment and closing costs for our home purchase, I had to liquidate my Roth IRA account. I *only* had two years’ worth of funding in there ($8,000), but I withdrew that principal PLUS the interest earnings, mistakenly convinced that I would not be penalized because the money was used for a home purchase by a first-time homebuyer (me, of course). I didn’t do enough research, and found that I still was beholden by the five-year rule: the Roth IRA had to have been open for at least five years to qualify for this exemption. Therefore, I not only had to pay taxes on the interest, but also pay a 10% penalty on said interest. Bummer, dude. If I had left the lousy $500 in earnings in the Roth IRA account, there wouldn’t have been any problem. This was the biggie — $8,000 back for the purchase of our home back in June. The purchase price was high enough to get us the entire $8K credit. Check out Form 5405 for details. We had two energy-efficient windows installed in the upstairs room we’ve been renovating (seemingly forever). The two windows cost $400 before installation, and we were able to recoup $120 of that back using Form 5695. We were able to deduct our property taxes, mortgage interest, state income taxes (but not the new car’s sales taxes, see below for explanation of why not). Unfortunately, we only had one quarter worth of property taxes and five months of mortgage interest to deduct this year. That means we should see a nice refund next year, because of the full 12 months of taxes and interest. I had four different 1099s from my various freelance writing side gigs and my book royalties, which have to be reported on Schedule C, along with any business expenses that can be deducted. This is one of the joys of freelancing — paying taxes on your earnings. Normally, if you’re getting a W-2, the employer pays half of the employment tax. When you’re self-employed, YOU have to pay all of the employment tax. We figured out what I owe using Schedule SE. I thought we would be able to deduct the state sales tax paid on our new truck, purchased last April. However, we found that it could only be deducted using Schedule L by those taking the standard deduction — we itemized, so we could only deduct EITHER state income taxes paid (~$2600) or the vehicle sales tax (~$1750). This was a no-brainer. Have you done your federal taxes for 2009 yet? Which deductions/tax credits do you qualify for? @Jessie: U.S. firms are supposed to send out paperwork by Jan. 31, and many wait until the last minute. Hopefully your forms will come ASAP. @Julie: Like Jessie, I had to wait for all my forms to come, and we had to do a paper return because of the first-time homebuyer credit. Glad you guys are done with debt! @Revanche: I hate waiting for paperwork — we would have filed weeks ago if we could've. I only do a little bit of freelance so I don't file quarterly. I claim 0 on my W-4 so it covers the taxes and I don't owe. @Little House: Paying is the worst, especially for the self-employed. I'll keep my fingers crossed that you get a refund instead! I'm dreading my tax returns. Because my husband and I are self employed, we normally break even, or get a very small amount back. Even after figuring out my income and using a schedule C. I'm just hoping I don't have to PAY this year, YIKES! I'm only halfway through, I can't figure out what the heck happened to my reporting from Emigrant Direct and Citibank. I did ours about 3 weeks ago and got my refund (federal) deposited last Wednesday. We got a nice chunk this year – way higher than any others – and I paid off my only 2 credit cards and Dave's car loan. I still have a few thousand left over which is just stashed away for the time being. It's soo nice to finally be (almost-I just have my car loan and that monthly payment is minimal) debt-free! The kids, sadly are the only credits worth mentioning since we don't own(yet!) We both claim zero all year long and withhold at a higher single rate, then file joint and claim the 2 kids come tax time.